Reference number for this case: 29-Sep-54-Montagney. Thank you for including this reference number in any correspondence with me regarding this case. Aimé Michel noted a number of sightings on September 29, 1954, and says there was one in Montagney. He indicates that at 8 p.m., a resident of this small village 32 km in straight line from Besançon in the Doubs department, returning from Rougemont a few kilometers to the east, was surprised to see the night lighting up suddenly. He looked up and saw in the sky going rather slowly from east to west a huge bright object the size of the full moon. He alerted other villagers who came out and saw the celestial object go away under the clouds to the west to disappear over the horizon. 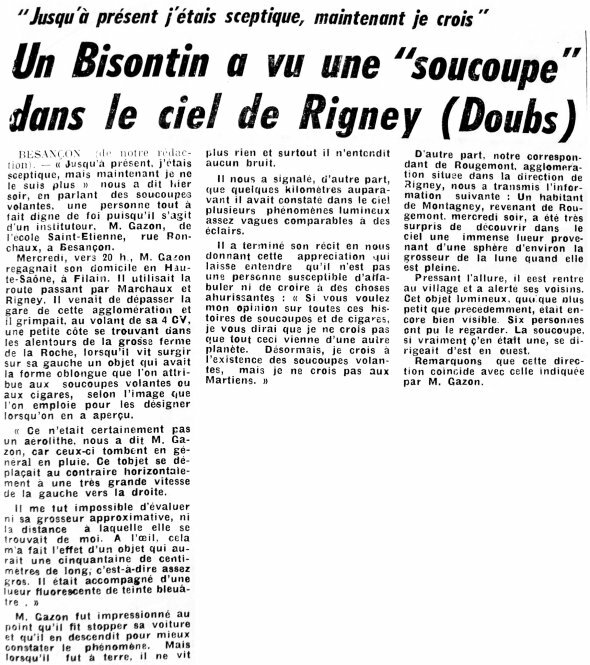 Luc Chastan indicates that in the Haute Saone in Montagney on September 29, 1954 at 20:00 hours "A resident returned from Rougemont when suddenly the night is illuminated. Looking up, he sees in the sky going from east to west at a slow pace, an enormous luminous object of the size of the full moon. He alerted the other villagers and all managed to see the object moving away under the clouds and disappearing at the horizon." Maybe the September 29, 1954, meteor, about 08:30 p.m.
1.1 Patrick Gross May 25, 2010 Addition [le1]. Change of explanation from "Not looked for yet. Possible meteor" to "Probably the meteor of that day". 1.2 Patrick Gross September 30, 2014 Addition [am1]. Explanation changed from "Probably the meteor of that day" to "Maybe the September 29, 1954, meteor, about 08:30 p.m."
1.3 Patrick Gross February 10, 2017 Addition [ub1].